Description: Masking tape, made of crepe paper coated with pressure – sensitive adhesive that is easily released on peeling. It is available in a variety of widths. It is used mainly in painting, to mask off areas that should not be painted. It is widely used in ply industry to hold sunmica when applied with adhesive. It is used in various powder coating industries and other. We offer our product that is designed and created by using best raw material in accordance with manufacturing standards by skilled workforces. In order to receive highest customers’ satisfaction, we offer our product in customer-required dimension. Customers can buy from us at most economical rates. 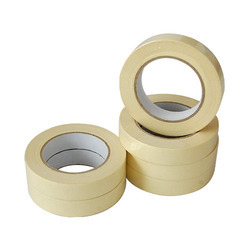 Our Masking tapes which can be used in various fields such as Automotive, Industrial, Hardware, Paints, Ply. Brands : We can provide various brands. We can provide customers in there brand also in diverse sizes, and patterns at the most reasonable price.